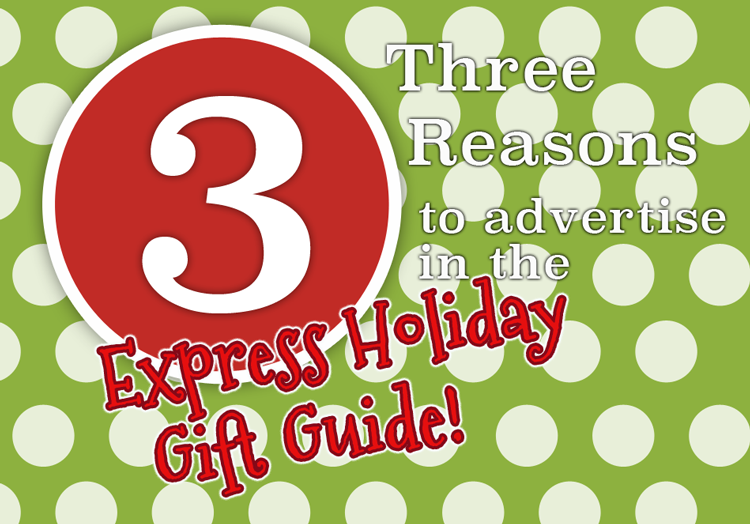 Just in case you need 3 reasons to advertise in the Express Holiday Gift guide, I will give them to you. Believe it or not, the holidays are right around the corner, and we all know how hectic that season gets. A 2008 holiday stress poll by the APA showed that more than eight out of 10 Americans anticipate stress during the holiday season. 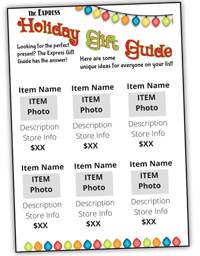 The Express Holiday Gift Guide will appear in print December 3rd and 4th, and online December 5, 2015. It is my job as the Express Media Editor to help you local business do what you do best – sell your wares. That’s is why we have developed a way to put you in front of local customers in a way that won’t break the bank. Affordability. For only $35*, you get to showcase one of your best products. It can be an item, a craft, a gift certificate – any offer that you are proud of and want to sell. Talk about a compelling reasons to bring customers into your store! Exposure. I almost listed this as the first reason to advertise in the gift guide, but I changed my mind. I thought you needed to now about the affordability factor. But this is actually my favorite reason why you should advertise in the Express Holiday Gift Guide. We have almost doubled our Facebook fanbase in the last six months. Our posts receive an average of 1,000 views. We also have a print audience of approximately 3,000 readers. Plus our websites are visited an average of 79 times per day. This brings you to your potential customers in a multi-platform approach. Value-Packed! This gift guide is beautiful. It prints in color, we feature one of your items in the center spread, the digital, online version will link to your website or email, you pick the item that you want to showcase. This is an example of how the listing will appear in print and online. The online version can link to your store’s web site. 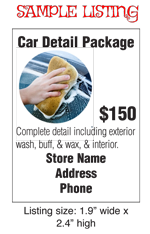 I am so proud to be able to offer you this cost-efficient, effective vehicle of bringing you sales this holiday season! It’s sure to be a feature we will repeat for years to come. Our Express Holiday Gift Guide prints December 3rd and 4th in both the Whitman-Hanson Express and the Plympton-Halifax Express, debuts online December 5th. *Book your space today! After November 15th, the price jumps to $45. Questions? Call Larisa at 781-293-0420 or email me at graphics@whitmanhansonexpress.com. Read more about dealing with holiday stress here at the American Psychological Association.